Merry Christmas From Fr Stephen! What do we mean when we wish each other Merry and Joyful Christmas? In our culture it has come to mean a wish for peace and goodness to others, and this is well and good. But for the Christian it is a statement acknowledging faith in a God who loved us so much that he sent his word to dwell among us in a baby named Jesus. Born in a manger in Bethlehem, the prophet Isaiah proclaimed this child to be “Emmanuel,” that is “God with us,” and indeed God has come so close to us in the birth of Jesus. 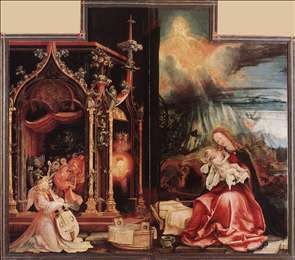 Christmas Joy then, is the contemplation of God’s infinite being becoming one with humanity as a fragile child: a small child in swaddling clothes and lying in a manger. The Christ Child’s fragility reminds us of our own numerous fragilities and weaknesses. It also encourages us though! It tells us that God is not indifferent to our sufferings and trials through life, but on the contrary he shares it with us. Emmanuel: God with us! Our Christmas joy focuses as well on Mary who welcomed this mystery into her life. Through Mary, Christ took flesh and became one of us and had not only a human face, but a voice to proclaim his Father’s greatness. He came to bring healing and new life to our fragile souls. Christmas then is also a joyful season because, like Mary, we become witnesses of Christ’s life giving love in our world by our openness to His presence in our lives, and through our own actions of peace and goodness which build up the kingdom of God here and now. In this way we truly welcome Emmanuel: God who is with us. With these thoughts in mind I wish you all a Christmas that is truly joyful and merry, an occasion for welcoming the greatest gift, God with us!